What I want to know: How will The Ocean Cleanup monitor changes in ocean-wide population structure? What community baselines have been established from which ecosystem impact can be assessed? What contingency are in place should catastrophic failure occur? 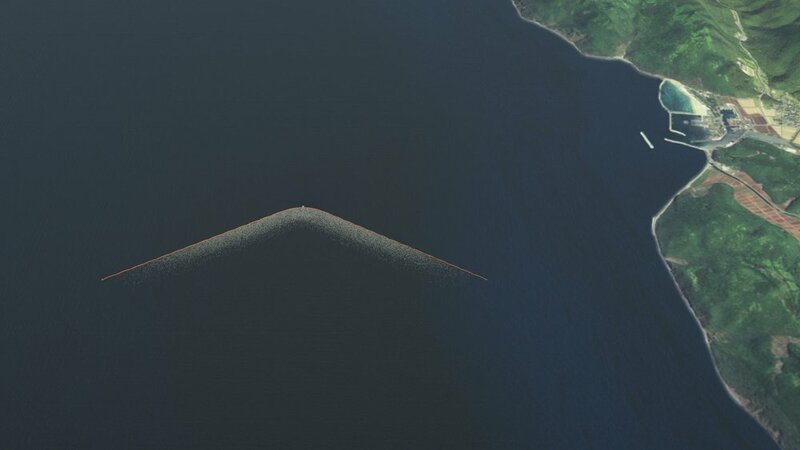 Ultimately, what chronic threshold will be used to trigger a shutdown of the Ocean Cleanup, should major environmental impacts be detected as a result of standard operation, who will access to the data necessary to monitor those impacts, and who will have authority to trigger a shutdown? 2. The Ocean Cleanup is a massive Fish Aggregating Device. Fish Aggregating Devices (or FADs) are one of a multitude of tools used by high seas fisheries to concentrate pelagic species in a small area. In it’s crudest form, an FAD is any floating, semi-stationary structure in the open ocean. Prey species tend to aggregate under floating structures, and predators naturally follow. The Ocean Cleanup won’t simply act as a barrier to migration, but will also attract pelagic species. Long term, this could create permanent or semi-permanent communities, resulting in changes to migratory patterns. In addition, fish concentrated around the Ocean Cleanup will be exposed to a higher concentration of plastics particulates, which may disrupt their feeding habitats and may increase mortality, even if bycatch issues are mitigated. What I want to know: How will the Ocean Cleanup address persistent fish populations and what steps will they take to manage potential chronic community impacts from exposure to concentrated ocean plastics. 3. The Ocean Cleanup is a high seas mining project. Even the feasibility study acknowledges that the Ocean Cleanup is essential a mining project, and ocean plastics are the resources that they are extracting. Because the Ocean Cleanup consists of floating structures on the high seas, rather than the seabed, they are not directly accountable to the International Seabed Authority. However, the ISA has spent the better part of the last decade establishing best practices for managing and mitigating the environmental impacts of sea floor mining operations (note, I have co-authored some of those papers and contributed to the ISAs formal recommendations). That the Ocean Cleanup hasn’t even addressed the bare minimum requirements for any other mining operation is troubling. What I want to know: Why is there, as of yet, no environmental impact assessment presented by The Ocean Cleanup to the public for review? How does the Ocean Cleanup plan to monitor the short- and long-term impacts of their operation? If The Ocean Cleanup believes themselves to be exempt from these requirements, how do they justify not being held to the minimum standards of every other organization in their industry? If deployed, The Ocean Cleanup will be the largest offshore structure in history, with tremendous potential to cause environmental harm. It is essential that we do not ignore the potential risk to ocean health in pursuit of a good cause. Due diligence and proper environmental impacts assessments are critical components for any large-scale engineering project.